We are the Drug Lab Crisis Litigation Unit, part of the Committee for Public Counsel Services (the Massachusetts public defender agency) dedicated to helping individuals with convictions tainted by the misconduct of former state drug lab chemists Annie Dookhan and Sonja Farak and two former Assistant Attorneys General. You can make a confidential call to the hotline operated by our paralegals and attorneys. The hotline is staffed Monday through Friday, from 9:30 a.m. to 5:00 p.m. If you call outside of these hours, you can leave a message and your call will be returned on the next business day. 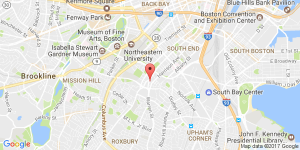 From 2003 to 2012, Annie Dookhan worked as a chemist at the Massachusetts Department of Public Health (DPH) Hinton Drug Lab testing suspected controlled substances for drug offense prosecutions. In 2012 it was learned that, during the course of her employment at Hinton, Dookhan improperly tested substances, intentionally altered test results, falsified reports, and falsely testified at criminal trials. Dookhan participated in the testing of over 80,000 samples, affecting well over 20,000 cases. She was eventually prosecuted, convicted, and imprisoned. 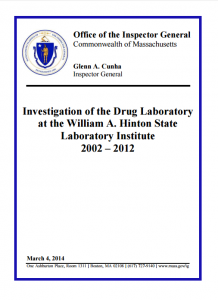 The Hinton Drug Lab was closed in August of 2012 due to Dookhan’s egregious misconduct and the mismanagement of the lab in general. There have been several important court decisions about the rights of people convicted of drug offenses based on analyses performed by Annie Dookhan. As a result of the most recent decision, called Bridgeman II, over 21,000 Dookhan convictions were vacated and dismissed. Notices from the court were sent to the people whose cases were dismissed. Approximately 300 other Dookhan convictions were not vacated and dismissed. A separate mailing was sent to those people to tell them how to challenge their convictions. Additional information for Dookhan defendants is provided below. From 2004 to 2013, Sonja Farak was employed as a chemist at the Massachusetts DPH Amherst Drug Lab. Farak was arrested in July 2013 after the lab’s supervisor found two missing evidence samples at her work station, along with evidence of drug use. She was subsequently indicted and in 2014 pleaded guilty to evidence tampering, stealing cocaine from the lab, and illegal possession of controlled substances. In 2016 it was revealed that Farak had been stealing drugs and using them on the job for the entire period of time she worked at the Amherst Drug Lab. Her drug use included marijuana, ecstasy, cocaine, amphetamine, methamphetamine, dextroamphetamine, ketamine, MDMA, MDEA, and LSD. Farak also admitted to tampering with samples that other chemists had analyzed and to stealing from the backlog of police submissions that were waiting to be assigned. In 2017, following a lengthy hearing, Superior Court Judge Richard Carey found that two lawyers from the Attorney General’s Office, Anne Kaczmarek and Kris Foster, had purposefully withheld exculpatory evidence that showed Farak had been engaged in widespread misconduct for years. The Attorney General’s Office originally maintained, and prosecutors argued, that Farak’s misconduct only began six months before her arrest. 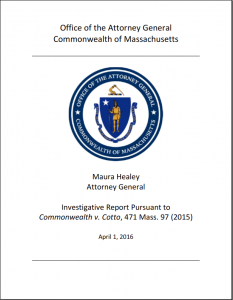 However, evidence that had been collected by the Massachusetts State Police and forwarded to the Attorney General’s Office clearly established that she had been engaged in theft and drug use for a longer period of time. Any case where the alleged drugs were methamphetamine and it was tested at the Amherst lab after August 1, 2004. Notices regarding this development have not yet been mailed out. Any individual who wishes to know the status of his or her case can call the CPCS hotline (1-888-999-2881). 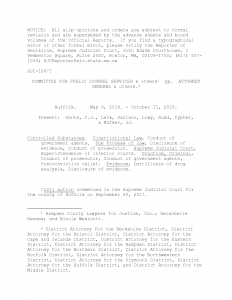 Additional information for Farak/Amherst defendants is available below. On January 18, 2017, the Supreme Judicial Court determined that over 20,000 individuals had yet to receive adequate notice that they may have been victimized by Dookhan’s misconduct. Accordingly, it ordered the District Attorneys to review, within 90 days, all the Dookhan cases they had identified in order to determine: 1) which individuals were entitled to relief; 2) which cases they would agree to vacate and dismiss; and 3) which cases they could and would re-prosecute, if the defendant won a motion for a new trial. Individuals who already had their Dookhan related charges addressed or who pleaded guilty before she completed the testing of the substances were identified and received no benefit from the court’s decision or the DA’s actions. Any person who believes they may have been improperly placed on this list can contact CPCS for additional information. Individuals whose convictions on Dookhan related charges were being vacated and dismissed with prejudice were identified. On April 19, 2017, the Supreme Judicial Court issued a declaratory judgement vacating (undoing) these convictions and dismissing the original Dookhan related charges “with prejudice,” meaning the government could never pursue the charges again. Over 21,000 drug charges were dismissed. Every individual whose charges were dismissed should have received a notice in the mail indicating the same. A copy of that notice is provided below. Each defendant’s criminal record should have been updated as of mid-summer 2017. Any defendant who wants to have their record checked to determine if it was properly updated or wants to know the status of any non-Dookhan related charges in their case can contact CPCS. Individuals whose convictions on Dookhan related charges were not being vacated and dismissed, because the DA’s certified they could and would re-prosecute, were also identified. Approximately 300 defendants were placed in this category. Each of these individuals should have received a separate mailing that included a detailed notice of his or her rights as well as a guidance letter from CPCS. A copy of that notice is provided below. Any such defendant who wishes to have a lawyer appointed to their case should call the “Dookhan Defendant” hotline number listed above. No action will be taken on their behalf unless CPCS is contacted. It is important for these individuals to understand that, if they choose to file a motion for a new trial, they can never face additional punishment. The Supreme Judicial Court has already ruled that, even if re-prosecuted, these defendants cannot be sentenced to any additional jail time or probation and cannot be subject to any new fines or fees. They also have other special legal rights, explained below. CPCS has hired additional staff in order to represent these individuals. The right to speak to a lawyer for advice about whether to challenge the conviction(s) and to be represented by counsel in court. If a Dookhan defendant cannot afford a lawyer, he or she will be appointed one free of charge. The right to a “conclusive presumption” that Ms. Dookhan committed serious misconduct in their case. This means that defendants do not have to prove that she mishandled the drug samples involved in the case. 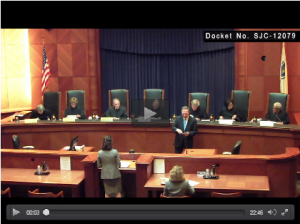 The right to ask a court to “vacate,” or undo, the conviction(s). Defendants who originally pleaded guilty have the right to withdraw their plea if they can show a “reasonable probability” that they would not have pleaded guilty if they had known about Ms. Dookhan’s misconduct. Defendants who were convicted at trial have the right to a new trial unless the court concludes that the Dookhan drug analysis did not influence the jury or had only a very slight effect on the jury. 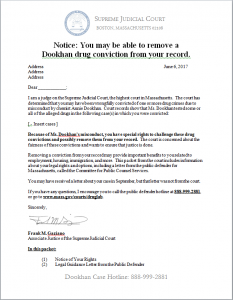 If you received a “Notice of Dismissal,” pictured below, any Dookhan related drug convictions associated with the case have already been vacated (undone) and these charges have been dismissed. If you were convicted of another offense in the same case, that conviction will remain in place. Due to the number of people who were placed in this category, it took until midsummer 2017 for criminal records to be updated. You can check to see the status of your criminal record by clicking the iCORI link below. If you believe that your record was not properly updated, or if you have any other questions about your case, you can contact CPCS at the Hotline number listed above. 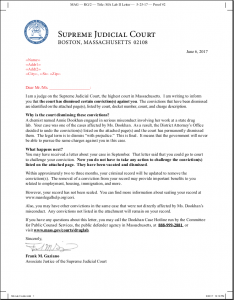 If you received a “Notice of Dookhan Conviction,” pictured below, believe you are indigent (unable to pay for a lawyer), and want the court to appoint an attorney to advise and represent you, you must contact CPCS. If you have any questions about the forms, or if you wish to speak with an attorney generally before deciding to proceed, you can also call the Hotline number listed above. If you do not respond, the court will not take any action with respect to your case. It is important to note that this automatic relief will ONLY affect drug convictions that fall into one of the above three categories. If a case had non-drug convictions, or drug convictions that do not fall into one of the above three categories, those convictions will not be automatically dismissed. Please contact our office for more information. 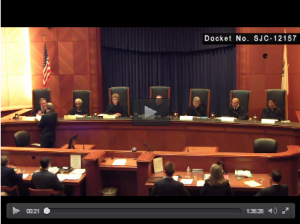 The SJC adopts a new protocol for case-by-case adjudication of drug cases potentially tainted by Dookhan’s misconduct. To accomplish case-by-case adjudication, the new protocol is to be completed in three phases. 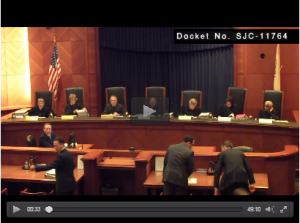 It will be implemented by the single justice in the form of a declaratory judgment. 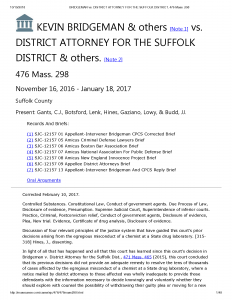 The District Attorneys were ordered to submit lists of convictions they intended to vacate and dismiss by April 18, 2017. Dookhan defendants who were convicted after trial are eligible to get relief. A defendant who was convicted after trial based upon Dookhan’s involvement is entitled to a presumption of egregious government misconduct. The conviction is to be vacated if it can be shown that, apart from the drug certificates, the evidence regarding the identity of the controlled substances was not overwhelming. Defendants who pleaded guilty before Dookhan tested the alleged drugs are not entitled to relief. Where the drug certificates involved in the defendant’s case indicate that Dookhan analyzed the drugs after the defendant pleaded, there is no presumption that her misconduct tainted the case. 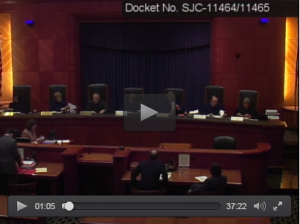 Dookhan defendants can move to vacate convictions without risk of further penalty. A defendant who has been granted a new trial based on Chemist Annie Dookhan’s misconduct at the Hinton drug lab cannot (1) be charged with more serious offenses than those of which they initially were convicted; and (2) if convicted again, cannot be given sentences longer than those that originally were imposed. Dookhan defendants who pleaded guilty before the alleged drugs were tested are entitled to a presumption of egregious government misconduct in their cases. In cases where Dookhan signed the certificate of drug analysis as either the primary or secondary chemist, the defendant is entitled to a conclusive presumption that misconduct occurred in the case, that it was egregious, and that it was attributable to the Commonwealth. The defendant is entitled to a new trial if he can demonstrate a reasonable probability that knowledge of the misconduct would have been material to the decision to plea. 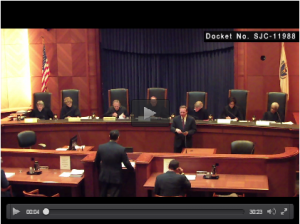 Superior court judges have authority to stay sentences of Dookhan defendants. In certain circumstances a Superior Court judge does have the authority to allow a defendant’s motion to stay the execution of his sentence, then being served, pending disposition of the defendant’s motion for a new trial. 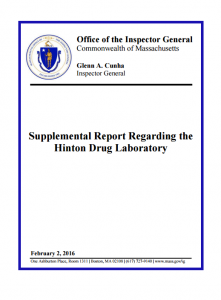 On March 4, 2014, the Office of the Inspector General released a report detailing the results of its investigation into Dookhan’s misconduct and other issues at the Hinton Drug Laboratory, where she worked. It issued a supplemental report on February 2, 2016. The Court ruled that Sonja Farak’s misconduct extended to all of her work at the Amherst laboratory. It also ruled that her misconduct rendered the work of the rest of the lab unreliable beginning on January 1, 2009 and the work of the lab specifically as to methamphetamine unreliable back to her arrival in August 2004. Based on this and the misconduct of former Assistant Attorneys General Anne Kaczmarek and Kris Foster, the court vacated and dismissed all convictions in those categories. The Court also ruled that the Attorney General’s office had to pay the costs of notifying defendants who received relief. 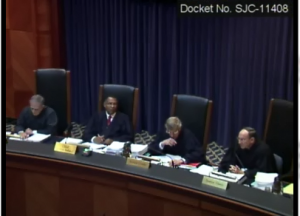 Finally, the Court asked the Rules of Criminal Procedure Standing Advisory Committee to propose an amendment to Rule 14 (regarding automatic discovery) consisting of a non-exhaustive checklist that would clarify and solidify the definition of exculpatory evidence, also known as a Brady checklist. The Court ruled that the Commonwealth had a duty to properly investigate Sonja Farak’s misconduct. 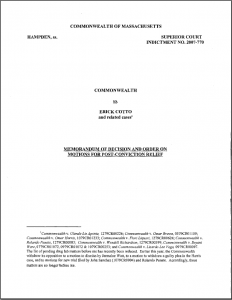 It also ruled that the Commonwealth, to that point, had done only a cursory review of the alleged misconduct and that the defendant was entitled to further information and discovery. The Court ruled that the Commonwealth had failed to properly investigate the extent of Sonja Farak’s misconduct. It noted that the Commonwealth had a duty to determine the nature and extent of Farak’s misconduct and suggested a more thorough review.